This is not what I had picked out or ironed this morning to wear to work. Sometimes I just change my mind last minute when I’m supposed to be out of the door dropping my car off at the mechanic. Clearly, that’s what husbands are for, right? I love this skirt but don’t wear it that often. Sometimes it’s a bit difficult to pull off the horizontal stripes and the fullness of it but it has pockets and it feels so light hearted to me me. Even though it’s grey and black the shape seems whimsical to me. And because the material is a bit heavier and darker I wanted to wear it one more time before spring comes (yes, I believe it is slowly starting to creep in). 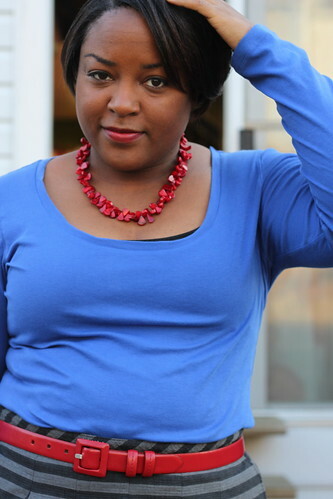 So I paired it with a bright blue layering top and black tank and added a dash of red with my lips, belt and necklace. 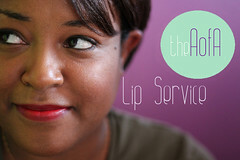 Full color lipstick really has become my go to accessory lately and I blame Nikkia of Silver Lips Beauty for turning me on to Ruby Woo lipstick. It’s absolute perfection. I should also be honest and admit that this morning I had on my black Steve Madden ankle booties (because they go so well with short skirts and black opaque tights) but as I was grabbing my tripod I sunk into a very deep spot of mud. So now I’m wearing this outfit with black cap toe ballet flats instead of boots but I think it’s just as cute. And the husband got the car to the mechanic just in time…and he just had to wait 10 minutes for me to pick him up. Clearly, he loves me. I LOVE LOVE LOVE this outfit! That skirt is oh so adorable! This is one of my favorite looks of yours. Super cute. @Brittany Thanks!! I appreciate it. I think it’s that blue, it makes anyone look happy. @Gabriella Thank you, this really is one of my favorite skirts. I know the rules say don’t do horizontal stripes but I love it! And it has pockets, how can I resist?! I love this outfit a lot!!! You look fantastic!! @Courtney thanks! I love that blue, I think everyone should wear that color. Loving this skirt! And Ruby Woo looks so divine on you! !